MANILA, Philippines - The October 2017 CPA board exam top 10 or topnotchers including other results - list of passers, top performing schools and performance of schools are released online today, November 2, 2017 or in 10 working days after the exam. Alfonso Solomon Ramos Magno from University of Santo Tomas (UST) aced the board with 91.33%. It was followed by Judy Ann Malate Tuzon, University of the East (UE) - Manila alumna with 91.17%. The Professional Regulation Commission (PRC) administered the licensure exam in the cities of Manila, Baguio, Cagayan de Oro, Cebu, Davao, Iloilo, Legaspi, Lucena, Tacloban and Tuguegarao on October 7, 8, 14 and 15, 2017. In the October 2016 CPA board exam, Vhinson Jay Samson Garcia from Wesleyan University of the Philippines - Cabanatuan City topped the board exam with 94.33%. Daryl John Sarmiento Punzalan from Southern Luzon State University (SLSU) - Lucban got the second spot with a close rating of 94.17%. In the October 2015 exams, Ralley Soriano Paragas from Colegio de Dagupan was named as the highest placer garnering 92.86%. Ian Kier Javate Valencia from Batangas State University (BatSU) - Batangas City ranked second with 92.57%. Here's overview of topnotchers for CPA board exam in the past three (3) years. 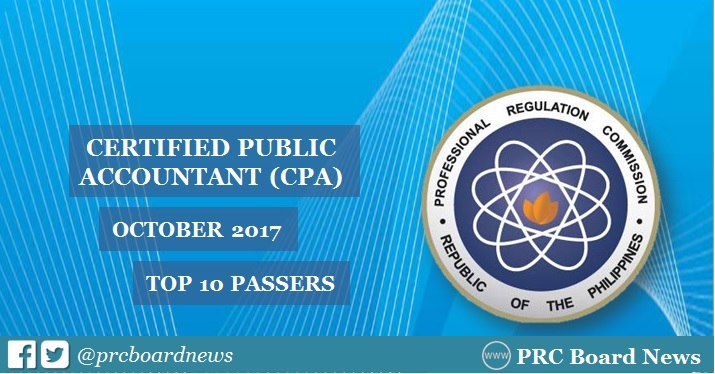 In an updated announcement on Wednesday, the Professional Regulatory Board of Accountancy on Facebook shared: "Due to the cancellation of government office work this week which resulted in the delay of the processing of PRC work, the new release date of the results of the October 2017 CPA Examinations will be on November 2 or 3, 2017, instead of the previously announced date of October 20/21, 2017." Majority rules system is the type of oversees in which individuals choose the president to control the nation and take care of the issues of the nation and convey it to the best to utilize the experience and here is check out https://www.writemyessayforme.net/write-my-essay-services/ for good work. Be that as it may, these days, another type of the vote based system keep running on the pinnacle and individuals did not comprehend this. The busy students want to help the teacher for getting the whole schedule of the year then they manage the study program. So they get the schedule and take part in the extracurricular activities.we can also check useful site the rooms assignment for the full filling the demands. Here you can check this post for getting more information about the result and University of the worlds. You can check the admission list and http://www.managementsop.com/help-in-writing-sop-for-operations-management/ demands according to the results.you will achieve the best progress in the academic level with the help of hardship in their fields.